Willow Ridge Retreat exists to create an oasis of peace in the busyness of our lives, an intentional calming, a place to disconnect from the daily urgent to reconnect to the soul urgent. Willow Ridge Retreat is conducive for individuals, couples, families, or friends, and promotes a tranquil rural setting for personal gatherings or small business meetings. 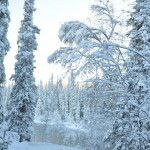 Some guests use Willow Ridge Retreat as their entire getaway while others enjoy the rural accommodations and use it as a base for other adventures in and around the city of Yellowknife. Willow Ridge Retreat intentionally steers toward the joy of quiet for your getaway. Known as “black–hole resorts” in current vacation trends, we choose to offer a quieter atmosphere. You won’t have to worry about turning off the TV or muting the movie or wondering if we offer free wi-fi, because we offer you silent spaces. The sound space will be yours to choose to fill as you wish; with continuing quiet, a conversation with others if you are travelling in a group, laughter, singing or making music, discussing strategies between turns during a board game, the scratch of your pen on paper as you write, listening for the sounds of the river lapping against the shore, ice talking in the winter, loons calling in the summer, or wind, just outside the windows, …. Depending on your provider, your cell phone may or may not be serviceable. Come share a piece or our Peace!